Kevin Maurice Garnett (born May 19, 1976) is an American former professional basketball player who played for 21 seasons in the National Basketball Association (NBA). Known for his intensity, defensive ability, and versatility, Garnett is considered one of the greatest power forwards of all time. He is one of four NBA players to win both the Most Valuable Player and the Defensive Player of the Year awards. [n 1] In high school, Garnett was a 1995 McDonald's All-American at Farragut Career Academy and won a national player of the year award. 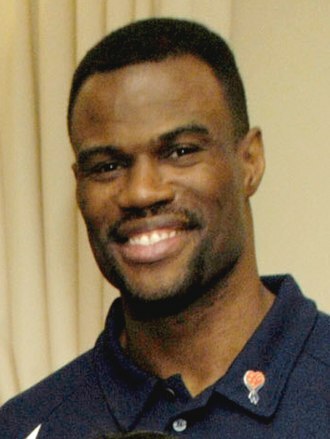 He entered the 1995 NBA draft, where he was selected with the fifth overall pick by the Minnesota Timberwolves and became the first NBA player drafted directly out of high school in 20 years. Garnett made an immediate impact with the Minnesota Timberwolves, leading them to eight consecutive playoff appearances. In 2004, he led the Timberwolves to the Western Conference Finals and won the NBA MVP Award. Garnett has been named to 15 All-Star Games, winning the All-Star MVP award in 2003, and is currently tied for third-most All-Star selections in NBA history. [n 2] He was named the NBA Defensive Player of the Year in 2007–08, and has been selected nine times for All-NBA Teams and 12 times for All-Defensive Teams. Garnett also holds several Timberwolves franchise records. In 2007, after 12 seasons with the Timberwolves, Garnett joined the Boston Celtics in a blockbuster trade. In his first year with the Celtics, he helped lead them to the NBA championship, while also finishing in third place for the MVP award. In 2013, Garnett was included in a second headline trade that sent him to the Brooklyn Nets with longtime Celtic Paul Pierce. In 2015, Garnett was traded back to Minnesota. He announced his retirement from professional basketball in September 2016. Garnett was born on May 19, 1976, in Greenville, South Carolina, to Shirley Garnett. He was the second of his mother's three children. 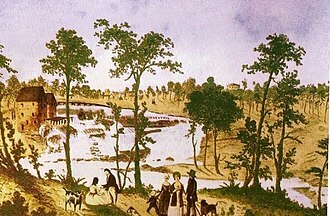 Garnett's mother never married his father, O'Lewis McCullough, with their relationship ending shortly after his birth. Garnett grew up with his mother and stepfather, Ernest Irby, with whom he didn't get along, and two sisters. Garnett fell in love with the sport of basketball while attending Hillcrest Middle School, although he did not play organized basketball until high school. In his first three years of high school, Garnett attended Mauldin High School in Mauldin, South Carolina and played on the school's basketball team. However, during the summer before his senior year of high school, Garnett was in the general vicinity of a fight between black and white students. Although not directly involved, Garnett was one of three students arrested for second-degree lynching, a charge that was expunged through a pre-trial intervention. Due to the racially charged incident and fearful of being a target, Garnett decided to leave Mauldin High and transferred to Farragut Career Academy in Chicago, for his senior year of high school. He led Farragut to a 28–2 record and was named National High School Player of the Year by USA Today. He was also named Mr. Basketball for the state of Illinois after averaging 25.2 points, 17.9 rebounds, 6.7 assists and 6.5 blocks while shooting 66.8% from the field. In four years of high school, Garnett posted an impressive 2,553 points, 1,809 rebounds and 737 blocked shots. In high school, Garnett played alongside Ronnie Fields, who also became a professional basketball player. Garnett was named the Most Outstanding Player at the McDonald's All-American Game after registering 18 points, 11 rebounds, 4 assists and 3 blocked shots, and then declared himself eligible for the 1995 NBA draft. To mark the 35th anniversary of the McDonald's All-American High School Boys Basketball Game, Garnett was honored as one of 35 Greatest McDonald's All-Americans. Garnett's decision not to play college basketball was influenced in part by his failure to score well enough on the ACT to meet NCAA requirements for freshman eligibility. Garnett told Student Sports Magazine in 1995 that if he had attended college he would have chosen to play college basketball for the University of Maryland. Garnett was drafted with the fifth overall pick in the 1995 NBA draft by the Minnesota Timberwolves, and became the first player to be drafted directly out of high school since 1975. Since joining the NBA for the 1989–90 season, the Timberwolves had not won more than 29 games in any season. In Garnett's rookie season, the Timberwolves were in the midst of a transition phase; they replaced Bill Blair with Flip Saunders as head coach early in the season, and made several trades. Garnett initially came off the bench in his rookie year, but moved into the starting lineup soon after Saunders became head coach. In his rookie year, Garnett and fellow newcomer Tom Gugliotta carried the scoring load. Garnett did not immediately leap to stardom as later prep-to-pro prospects such as Amar'e Stoudemire, LeBron James and Dwight Howard would, but he did have a very respectable rookie year. He averaged 10.4 points, 6.3 rebounds and 1.8 assists per game and was voted to the All-Rookie Second Team. Despite having some promising players, the Timberwolves suffered through their seventh consecutive sub-30 win season and failed to make the playoffs. At the time, Garnett was the youngest NBA player in history at 19 years and 11 months of age. Before the 1996–97 season, the Timberwolves made a draft-day trade for point guard Stephon Marbury of the Georgia Tech Yellow Jackets. During the season, Garnett posted improving averages of 17.0 points, 8.0 rebounds, 3.1 assists, 2.1 blocks and 1.7 steals. He also had two games where he registered eight blocks. With a 40–42 record, the Timberwolves made their first playoff appearance in franchise history, Garnett and Gugliotta made their first All-Star appearances, and Marbury established himself as a valuable young lead guard. However, the Houston Rockets, led by Hakeem Olajuwon, Clyde Drexler, and Charles Barkley, proved to be too much as the Timberwolves were swept 3–0 in the first round of the 1997 NBA Playoffs. During the 1997–98 NBA season, the Timberwolves and Garnett agreed on a six-year contract extension that was worth an unparalleled $126 million. The contract was considered a risky move and many analysts speculated that the deal would make it impossible for the Wolves to sign new players or even keep their own. The enormous size of Garnett's contract was considered, by numerous sports writers, a major cause of labor tensions between players and owners that led to a lockout which shortened the 1998–99 NBA season. Despite the furor over his new contract, Garnett continued to improve, averaging 18.5 points, 9.6 rebounds, 4.2 assists, 1.8 blocks, and 1.7 steals per game. Again, he was an All-Star, and the Timberwolves finished with their first winning record in franchise history (45–37 for the season). For the second consecutive year, the young Timberwolves bowed out of the playoffs in the first round, this time losing 3–2 to the Seattle SuperSonics and superstar point guard Gary Payton. The two wins against the Sonics marked the Wolves' first-ever playoff game wins. The off-season started poorly for the Timberwolves though as 20-point per game scorer Tom Gugliotta left for the Phoenix Suns. In the lockout-shortened season that followed, Garnett broke through as a superstar. Putting up stats of 20.8 points, 10.4 rebounds, 4.3 assists and 1.8 blocks per game, he was named to the All-NBA Third Team. However, midway through the season, Stephon Marbury was traded to the New Jersey Nets. Although the Wolves received two-time All-Star Terrell Brandon in return, they were not able to overcome the discord and limped into the playoffs as the eighth seed with a 25–25 record. The Wolves were defeated in the first round again, this time losing 3–1 to the eventual champion San Antonio Spurs who were led by young superstar and eventual NBA Finals MVP Tim Duncan. In the 1999–2000 NBA season, Garnett continued his notable play, averaging 22.9 points, 11.8 rebounds, 5.0 assists, 1.6 blocks and 1.5 steals per game. Garnett also made the first of his four All-NBA First Team appearances and came in second place in the MVP voting. Assisted by sharpshooting rookie forward Wally Szczerbiak and steady veteran Terrell Brandon, the Wolves posted a franchise-best 50–32 record, but succumbed in the first round to the Portland Trail Blazers 3–1. On May 20, 2000, Timberwolves' guard and Garnett's close friend Malik Sealy was killed by a drunk driver shortly after celebrating Garnett's 24th birthday. Later that year, the NBA ruled that the free agent signing of Joe Smith was illegal. The league punished the team for the illegal signing by stripping them of three first-round draft picks, fining Glen Taylor (the owner of the team) $3.5 million, and banning general manager Kevin McHale for one year. 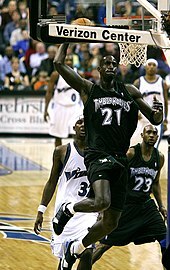 In the 2000–01 NBA season, Garnett led the Wolves to a 47–35 record and made the All-NBA Second Team, but again, the Wolves did not survive the first round of the playoffs, losing to the Spurs 3–1. In the 2001–02 season, Garnett posted another notable season, his averages of 21.2 points, 12.1 rebounds, 5.2 assists, 1.6 blocks and 1.2 steals per game enough for another All-NBA Second Team nomination. However, the Timberwolves bowed out in the first round for the sixth consecutive time, this time getting swept 3–0 by the Dallas Mavericks led by Michael Finley, Steve Nash and Dirk Nowitzki. Garnett's next season was one of the best of his career, his 23.0 ppg / 13.4 rpg / 6.0 apg / 1.6 bpg / 1.4 spg season earning him his second All-NBA First Team nomination and second place in the MVP voting. The Timberwolves posted a good 51–31 record, but for the seventh consecutive time, they did not make it out of the first round, this time losing to the Los Angeles Lakers 4–2. In the 2003–04 season, things finally seemed to come together for Garnett. In past years, the Wolves had practically been a one-man show, but now, the Timberwolves had made two valuable acquisitions: highly talented but volatile swingman Latrell Sprewell and the seasoned two-time NBA champion Sam Cassell, who supplanted Troy Hudson at point guard. In addition, defensive center Ervin Johnson complemented the inconsistent Michael Olowokandi. Powered by the best supporting cast in his career, Garnett averaged 24.2 points, 13.9 rebounds, 5.0 assists, 2.2 blocks and 1.5 steals per game for the season. Having recorded career-highs in points, rebounds, blocks and leading the league rebounds, Garnett was named the league Most Valuable Player for the first time in his career. With a franchise-record 58 wins, the Wolves stormed into the playoffs, and finally conquered their playoff bane by defeating the Denver Nuggets 4–1 in the first round. 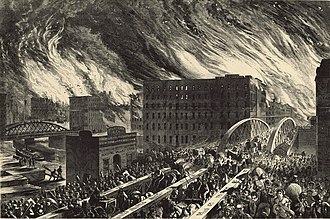 After disposing of the strong Sacramento Kings 4–3 in the Western Conference semi-finals, Garnett and the Timberwolves met the Lakers in the Western Conference Finals. There, playmaker Cassell went down with a back injury. With reserve point guard Hudson also injured, the Timberwolves alternated between third playmaker Darrick Martin and shooting guard Fred Hoiberg at the "one", or even running Garnett himself as point forward or a real point guard. The Los Angeles Lakers pulled off a 4–2 victory in the series. In the 2004–05 season, Garnett was named to the All-NBA Second Team, but the Timberwolves failed to make the playoffs for the first time in eight years with a record of 44–38. 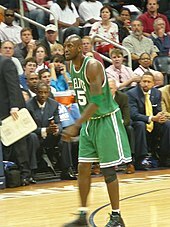 The 2005–06 season brought more frustration for Garnett. Sprewell turned down a three-year, $21 million extension, and the Wolves wary of his injuries and age, traded Cassell for the much less effective Marko Jarić, and the team's record for 2005–06 fell to 33–49. Despite Garnett's play, the team logged the second worst record since Garnett joined the franchise. Garnett subsequently earned All-NBA Third Team honors. During the 2007 off-season, Glen Taylor admitted that although he had planned on retaining Garnett, he would finally listen to trade offers. Garnett's name was mentioned in various trade rumors involving the Chicago Bulls, Los Angeles Lakers, Golden State Warriors, Indiana Pacers, Boston Celtics, Phoenix Suns and Dallas Mavericks. On July 31, 2007, Garnett was traded to the Boston Celtics in exchange for Al Jefferson, Ryan Gomes, Sebastian Telfair, Gerald Green, Theo Ratliff, cash considerations, Boston's 2009 first-round draft pick (top 3 protected), and the 2009 first-round pick which Minnesota had traded to Boston in the Ricky Davis–Wally Szczerbiak trade of 2006. The 7-for-1 deal constitutes the largest number of players traded for a single player in league history. At the time of the trade, Garnett had the longest current tenure of any player in the NBA with one team, having played for the Timberwolves for his first 12 seasons (a total of 927 games). Garnett said that he was proud to be a part of the Celtics, and hoped to continue its proud tradition and basketball success. On the day the trade was announced, Garnett signed a three-year, $60 million contract extension that would start after his prior deal ran out in 2009. On August 1, the day after signing with the Celtics, Garnett threw the ceremonial first pitch at Fenway Park prior to a Red Sox–Orioles game. The trade for Garnett had many experts speculating that the Celtics would have a resurgence during the 2007–08 season. 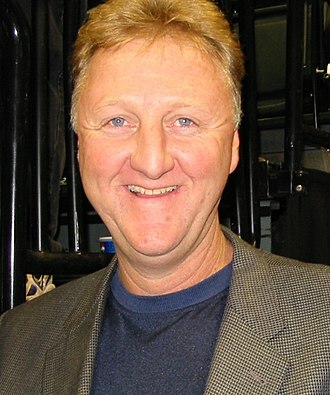 The combination of Paul Pierce, Ray Allen, and Garnett were almost automatically nicknamed "The Big Three" by the media, after the Larry Bird, Kevin McHale, and Robert Parish trio. Garnett wore jersey number 5 for the Celtics since his number with the Timberwolves, number 21, was retired by the Celtics, previously worn by Bill Sharman. He made his Boston debut with a strong performance against the Washington Wizards, with 22 points and 20 rebounds. He also led all players in voting for the 2008 NBA All-Star Game. Garnett received 2,399,148 votes, the sixth highest total in NBA All-Star balloting history. However, Garnett was unable to play due to an abdominal strain, and Detroit Pistons forward Rasheed Wallace was named to replace him. 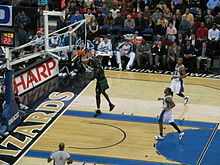 Garnett passed 20,000 points for his career, becoming the 32nd player in NBA history to reach the mark, with a layup in the second quarter against the Memphis Grizzlies on March 8. On April 22, Garnett was named the NBA Defensive Player of the Year for the 2007–08 season. It was the only major award a Celtic player had not claimed since the franchise's foundation in 1946. Garnett said it was a team effort which helped him win the award. Garnett was also third in MVP voting for the year, behind only Kobe Bryant and Chris Paul. Garnett helped the Celtics to their 17th NBA Championship, with 26 points and 14 rebounds in Game 6 of the NBA Finals. During that championship season, Garnett and Celtics legend Bill Russell developed a relationship, which Garnett credited as a major influence in helping him succeed during his first season as a Celtic. On June 18, 2008, Garnett and Ray Allen appeared on the Late Show with David Letterman, soon after winning the championship. In the 2008–09 season, Garnett started all of the 57 games he was able to suit up for. He averaged 15.8 points, 8.5 rebounds and 2.5 assists. On October 31, 2008, Garnett became the youngest player in NBA history to reach 1,000 career games, at 32 years and 165 days. Garnett earned his twelfth consecutive All-Star Game start on February 15, 2009. Following the All-Star Game, during a game against the Utah Jazz, Garnett strained his right knee late in the second quarter. The injury occurred on February 19, 2009, while attempting to go up for an alley-oop. He was forced to miss the next 14 games. Upon his return from the injury, he averaged 9 points and 4.5 rebounds in four games before being shut down for the season permanently, missing the final 25 games of the regular season, as well as the 2009 playoffs due to a right knee sprain. Without Garnett, the Celtics advanced to the Eastern Conference semi-finals, but were eliminated by the Orlando Magic. 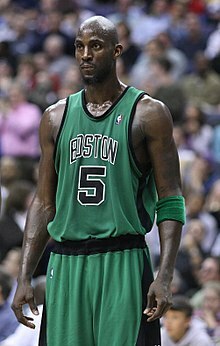 In the 2009–10 season, Garnett and the Celtics, joined by newly signed free agent Rasheed Wallace, struggled with injuries and inconsistency throughout much of the regular season and earned the fourth seed in the Eastern Conference playoffs. Garnett was selected to play in the 2010 NBA All-Star Game (his 13th All-Star Game selection). Despite being written off by nearly every major sports analyst, the Celtics elevated their play and consistently, and dominated opponents much as they did during their 2008 championship run. They eliminated the Miami Heat, Cleveland Cavaliers, and Orlando Magic to advance to face the Los Angeles Lakers in the 2010 NBA Finals. 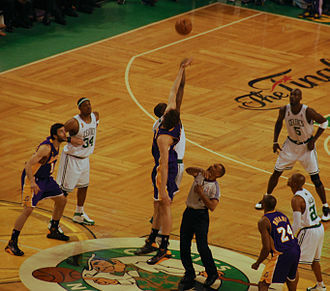 The 2010 Finals went to a decisive seventh game in Los Angeles, where the Celtics led well into the third quarter before the Lakers mounted a comeback and held on for the victory. In the 2010–11 NBA season, Garnett and the Celtics started strong, winning 23 of their first 26 games. On December 30, 2010, Garnett injured his right knee after he tried to dunk. He missed two weeks with the injury. Garnett returned on January 17, 2011 to face the Orlando Magic. The Celtics ended the regular season third in the Eastern Conference behind the Chicago Bulls and the Miami Heat. Garnett averaged under 15 points, under 9 rebounds, and a career low 0.8 blocks per game. After sweeping the New York Knicks in the first round, they faced the Heat in the semi-finals. After losing the first two games of the series, Garnett's playoff high 28 points helped the Celtics take Game 3. However, the Heat won the next two games, winning the series 4–1. In the lockout shortened 2011–12 NBA season, Garnett and the Celtics started off slowly, being below .500 with a 15–17 record by the All-Star break. Garnett was not selected for the All-Star game for the first time in 11 years. After, however, Boston quickly became one of the best teams in the league, finishing the second half of the season with a 24–10 record, entering the playoffs as the fourth seed in the Eastern Conference with a 39–27 record. Boston made a deep run in the playoffs, going all the way to the Eastern Conference Finals. They faced the Atlanta Hawks in the first round, defeating them in six games. Boston then defeated the Philadelphia 76ers after a challenging seven-game series. Boston made the Eastern Conference Finals for the third time in five years, and faced another superstar trio in Chris Bosh, Dwyane Wade and LeBron James of the Miami Heat. The Celtics lost the first two games, but came back strong to win the next three games. However, the Heat were too strong in Games 6 and 7, defeating the Celtics 4–3. Garnett found a resurgence in the playoffs, averaging 19.2 points, 10.3 rebounds and 1.4 blocks per game. On June 30, 2012, Garnett agreed to a three-year contract extension with the Celtics worth an estimated $34 million. On January 17, 2013, it was announced that Garnett had been voted to start in the 2013 All-Star Game in Houston. On February 7, 2013, Garnett recorded his 25,000th point in a 116–95 victory over the Los Angeles Lakers. On June 28, 2013, the day of the NBA draft, the Boston Celtics and the Brooklyn Nets reached a deal to trade Garnett, Paul Pierce and Jason Terry for future first-round picks in the 2014, 2016, and 2018 drafts, as well as Kris Humphries, Gerald Wallace, Kris Joseph, MarShon Brooks and Keith Bogans. The deal was finally completed on July 12, with Brooklyn also receiving D. J. White. Garnett chose to wear number 2 to honor his former Minnesota Timberwolves teammate Malik Sealy. On December 13, 2013, Garnett surpassed 14,000 career rebounds, becoming only the tenth player in NBA history to do so. In reaching the milestone, Garnett also joined Kareem Abdul-Jabbar and Karl Malone as the only players to reach 25,000 points, 14,000 rebounds and 5,000 assists. He reached the milestone in the third quarter of a 103–99 road loss to the Detroit Pistons. The Nets cherished Garnett's leadership and passion. Despite boasting a starting line-up of Deron Williams, Joe Johnson, Brook Lopez, Paul Pierce, and Garnett, the Nets were unable to advance past the second round of the playoffs, while Garnett finished his 19th NBA season with career low averages of 6.5 points and 6.6 rebounds per game. On November 1, 2014, Garnett had arguably his best game for the Nets as he recorded 18 points and 14 rebounds in 35 minutes of action in the Nets' 102–90 win over the Detroit Pistons. 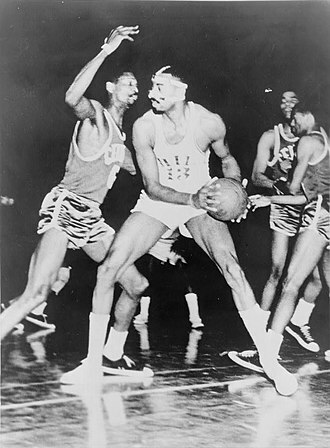 Six days later, he recorded five rebounds in a 110–99 win over the New York Knicks and by doing so, passed Walt Bellamy for ninth place on the all-time rebounding list. On February 19, 2015, Garnett agreed to waive his no-trade clause in order to be traded back to Minnesota in exchange for Thaddeus Young. Six days later, he made his return for the Timberwolves against the Washington Wizards at the Target Center, recording five points on 2-of-7 shooting with eight rebounds and two blocks in 19 minutes in his first game for Minnesota since 2007. He appeared in just five games for the Timberwolves in 2014–15, before sitting out the team's final 21 games of the season due to a nagging knee injury. On July 11, 2015, Garnett re-signed with the Timberwolves to a two-year deal. On November 15, 2015, against the Memphis Grizzlies, Garnett became the fifth player in NBA history to play at least 50,000 minutes, joining Kareem Abdul-Jabbar, Karl Malone, Jason Kidd and Elvin Hayes. On December 1, against the Orlando Magic, Garnett surpassed Kidd (50,110) for third on the NBA's career minutes list. Four days later, in a loss to the Portland Trail Blazers, he became the 15th player in NBA history to surpass 26,000 career points. On December 11, Garnett passed Malone as the NBA's all-time leader in defensive rebounds during Minnesota's 111–108 overtime loss to the Denver Nuggets. He finished the game with four defensive boards to give him 11,409 for his career, three ahead of Malone. Garnett appeared in 38 of the team's first 45 games of the season before missing the entire second half of the season with a right knee injury, the same knee that kept him out of 25 games in 2008–09 when he was playing for Boston, as well as much of his post-trade time in Minnesota during the 2014–15 season. On September 23, 2016, Garnett announced his retirement after 21 seasons in the NBA. While Garnett did express interest in playing for one more season with the Timberwolves, primarily with the goal in helping the team make it to the playoffs again with its promising young players and new head coach, he also told the team's owner that he wasn't sure that his knees would hold up for one more season. In the 2000 Summer Olympics, Garnett won a gold medal as a member of the United States national team. In his first and only FIBA tournament, Garnett averaged 10.8 points, 9.1 rebounds and 2.1 assists per game. In October 2016, Garnett joined the crew on TNT's Inside the NBA. The following month, he became the host of his own segment, Area 21. In January 2017, Garnett joined the Los Angeles Clippers as a consultant. He also consulted with the Milwaukee Bucks during the 2016–17 season. In July 2004, Garnett married his longtime girlfriend Brandi Padilla during a private ceremony in California. 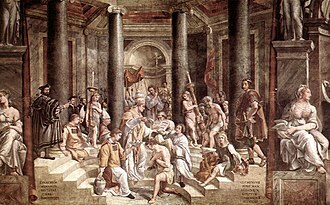 Due to the wedding, Garnett did not take part in the Athens Olympic Games. The couple has two daughters. On July 12, 2018, Garnett's wife filed for divorce, asking for custody of the children. Garnett is the half-brother of former basketball player Louis McCullough. Another professional basketball player, former Los Angeles Laker Shammond Williams, is his cousin. His nicknames include "The Big Ticket", "KG", "The Kid" and formerly "The Franchise" (after being known as the Minnesota Timberwolves' franchise player). Before games, he mentally prepares himself by banging his head against a padded basketball stanchion. Although Garnett is officially listed as 6 ft 11 in (2.11 m) by the NBA, he is widely accepted to be at least 7 ft 0 in (2.13 m) tall. During the 2007 NBA All-Star Game, Garnett admitted in an interview with Craig Sager to be "6 ft 11 in and some quarters" tall. Measurements from the 1995 NBA draft show the 19-year-old Garnett measured 6 ft 11 in (2.11 m) tall barefoot. In 1997, Garnett was measured by Minnesota Timberwolves training staff as 7 ft 1 in (2.16 m) tall in his basketball shoes. In December 2011, Garnett agreed to become a limited shareholder of American-owned Italian Serie A football team A.S. Roma. ^ David Robinson, Michael Jordan and Hakeem Olajuwon are the other three. ^ Garnett is tied with Shaquille O'Neal and Tim Duncan. They trail Kobe Bryant (17 selections) and Kareem Abdul-Jabbar (19). ^ "Ranking the 25 greatest players in NBA history". FOX Sports. October 20, 2017. Retrieved March 7, 2019. ^ "Before they were stars: Boston Celtics' Kevin Garnett". ESPN. June 8, 2010. Retrieved December 29, 2010. ^ a b "Wilkins Honored as One of 35 Greatest McDonald's All Americans". NBA. January 31, 2012. Retrieved February 9, 2012. ^ a b c d e f g h "Kevin Garnett Statistics". Basketball-reference.com. Retrieved October 27, 2008. ^ Frank Sinton, Steven Michaels (executive producers) (2003). Beyond the Glory (Television production). Fox Sports Network. ^ "'Da Kid' progressed quickly". ESPN.com. Retrieved January 16, 2017. ^ "Beyond the Glory – Kevin Garnett part 4". YouTube.com. August 24, 2007. Retrieved April 20, 2012. ^ "JockBio: Kevin Garnett Biography". Jockbio.com. Archived from the original on May 12, 2010. Retrieved October 27, 2008. ^ a b c d e f "Kevin Garnett Stats, Video, Bio, Profile". NBA.com. Archived from the original on December 9, 2015. Retrieved December 20, 2015. ^ Farber, Michael (January 20, 1997). "Feel the Warmth the Timberwolves' Twin Wunderkinds, Kevin Garnett and Stephon Marbury, Have Built what Minnesota Hopes Is a Lasting Bond". Sports Illustrated. Retrieved February 28, 2017. ^ Hudson, John W. (2007). Ignored and Ignited: H.o.o.p.s of Life. AuthorHouse. p. 145. ISBN 9781434327079. Retrieved March 1, 2017. ^ "From preps to the pros: High school senior Garnett enters NBA draft". Star News Services. May 12, 2005. Retrieved on February 22, 2009. ^ "Minnesota Timberwolves (1989 – ) Stats, History, Awards and More". Databasebasketball.com. Archived from the original on October 6, 2008. Retrieved October 27, 2008. ^ Sid Hartman, Star Tribune (June 25, 2007). "Sid Hartman, June 21: KG traded? Taylor says don't bet on it". Startribune.com. Archived from the original on October 13, 2007. Retrieved October 27, 2008. ^ Stein, Marc (June 23, 2007). "Wolves-Celtics trade talk? Garnett says forget it". ESPN.com. Retrieved January 6, 2016. ^ Berger, Ken (June 25, 2007). "Garnett-to-Lakers talk buzzes around NBA". NewsDay.com. Archived from the original on June 30, 2007. Retrieved January 6, 2016. ^ "Phoenix, Atlanta, Minnesota Three-Way Close?". RealGM.com. June 27, 2007. Archived from the original on June 29, 2007. Retrieved January 6, 2016. ^ "Celtics Acquire 10-Time All-Star Kevin Garnett | Celtics.com". Nba.com. Retrieved October 27, 2008. ^ Marc Stein (July 31, 2007). "Sources: Celtics, Wolves agree to Garnett megadeal". Sports.espn.go.com. Retrieved April 20, 2012. ^ "KG says Celtics his best shot at a ring". MSNBC. July 31, 2007. Retrieved April 20, 2012. ^ Alex McPhillips. "Garnett makes a splash at Fenway". Boston Red Sox. MLB. Retrieved April 20, 2012. ^ "Reaction to the Celtics Acquiring Kevin Garnett". NBA.com. Retrieved May 15, 2010. ^ "Allen, Garnett, Pierce continue Big 3 tradition". 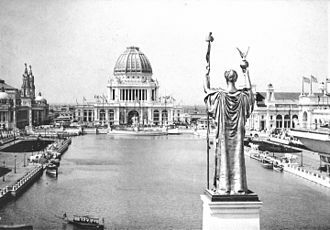 commercialappeal.com. Retrieved May 15, 2010. ^ Associated Press. (November 2, 2007). "Washington Wizards vs. Boston Celtics Recap". ESPN. Retrieved on July 18, 2009. ^ "Boston's Kevin Garnett Top Vote-Getter Among All-Stars". Nba.com. January 25, 2008. Retrieved April 20, 2012. ^ Garnett out of All-Star Game, Wallace in, Boston Herald, February 10, 2008. ^ Steve Bulpett, No 'Big Ticket' for an All-Star event, Boston Herald, February 11, 2008. ^ Marc J. Spears, Rondo will have to pay up, The Boston Globe, February 16, 2008. ^ "Kevin Garnett Reaches 20,000-Point Plateau". Nba.com. March 9, 2008. Retrieved April 20, 2012. ^ Steve Bulpett, C's go extra milestone – Numbers come up for Garnett, Allen, Boston Herald, March 9, 2008. ^ "Kevin Garnett Wins Kia Defensive Player of the Year". Nba.com. April 25, 2008. Retrieved April 20, 2012. ^ Kevin Garnett Wins NBA Defensive Player of the Year Archived May 2, 2008, at the Wayback Machine, Celtics.com, April 22, 2008. ^ Marc J. Spears, Garnett wins NBA defensive player award, The Boston Globe, April 22, 2008. ^ Couper Moorhead, KG Calls Defensive Player of the Year Award a "Team Effort" Archived May 1, 2008, at the Wayback Machine, Celtics.com, April 22, 2008. ^ "Kobe Bryant Wins Most Valuable Player Award". Nba.com. May 6, 2008. Retrieved April 20, 2012. ^ "Bill Russell and Kevin Garnett: March 6, 2008". nba.com. Archived from the original on June 18, 2010. Retrieved May 15, 2010. 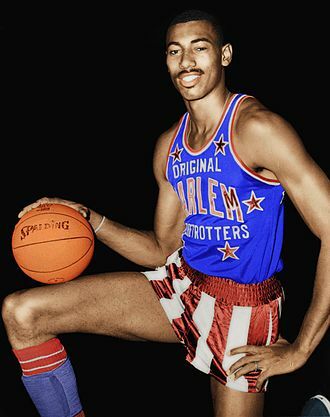 ^ "Garnett, Allen Appear On Letterman". wbztv.com. Archived from the original on October 4, 2008. Retrieved May 15, 2010. ^ Garnett becomes youngest to reach 1,000 games, leads Celtics past Bulls, Associated Press, October 31, 2008. ^ Frank Dell'Apa, Rondo's deal is extended, The Boston Globe, November 1, 2008. 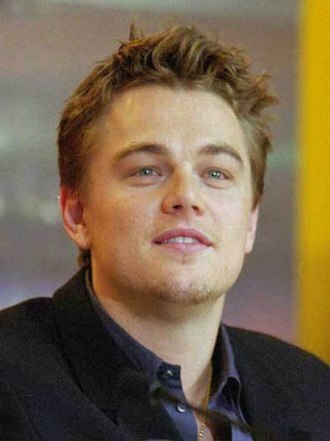 ^ Associated Press (February 19, 2009). "Boston Celtics vs. Utah Jazz Recap". ESPN. Retrieved on July 15, 2009. ^ Spears, Marc J. (May 18, 2009). "Comfortable with the long-term picture". The Boston Globe. ^ Beacham, Greg (June 18, 2010). 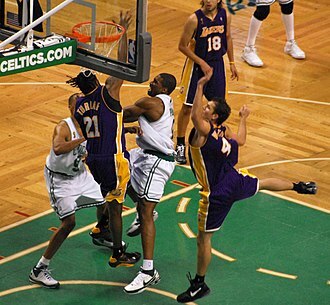 "Lakers edge Celtics in Game 7, win 16th title". Yahoo! Sports. Archived from the original on August 5, 2011. Retrieved December 29, 2010. ^ "Kevin Garnett 2010-11 Game Log". Basketball-Reference.com. Retrieved December 20, 2015. ^ "2010-2011 Celtics Regular Season Wrap-Up". Sports of Boston. Archived from the original on November 29, 2011. Retrieved August 10, 2012. ^ "Celtics vs. Heat | Eastern Conference Semi-Finals | 2011 NBA Playoffs". NBA.com. Retrieved August 10, 2012. ^ Washburn, Gary (June 30, 2012). "Garnett agrees to an extension with Celtics". The Boston Globe. Retrieved June 30, 2012. ^ "Sources: Kevin Garnett returning". ESPN. June 30, 2012. Retrieved June 30, 2012. ^ "Nets, Celtics work out blockbuster". ESPN. June 28, 2013. Retrieved June 28, 2013. ^ "Nets Acquire NBA Champions Kevin Garnett, Paul Pierce and Jason Terry". NBA.com. Turner Sports Interactive, Inc. July 12, 2013. Retrieved July 14, 2013. ^ "Kevin Garnett, Paul Pierce, Jason Terry Brooklyn Nets Jerseys Already For Sale". NESN.com. July 12, 2013. Retrieved July 14, 2013. ^ "Garnett to wear No. 2 to honor Sealy". ESPN.com. July 18, 2013. Retrieved July 18, 2013. ^ "Wolves Acquire Forward Kevin Garnett". NBA.com. February 19, 2015. Retrieved February 19, 2015. ^ "Kevin Garnett a winner in emotional return to Wolves". NBA.com. February 25, 2015. Retrieved February 25, 2015. ^ Faklis, Tim (June 21, 2015). "2014-15 Roster Review: Kevin Garnett". awolfamongwolves.com. Retrieved January 30, 2016. ^ "Timberwolves Re-Sign Forward Kevin Garnett". NBA.com. July 11, 2015. Retrieved July 13, 2015. ^ "Timberwolves bring back Kevin Garnett, sign Karl-Anthony Towns". ESPN.com. July 7, 2015. Retrieved July 7, 2015. ^ "Conley, Green lead Grizzlies over Timberwolves 114-106". NBA.com. November 15, 2015. Retrieved November 15, 2015. ^ "Magic hold off late charge from Wolves for 4th straight win". NBA.com. December 1, 2015. Retrieved December 1, 2015. ^ "Blazers come back from 17 down again to beat Wolves". NBA.com. December 5, 2015. Retrieved December 5, 2015. ^ "Kevin Garnett passes Karl Malone as NBA's all-time def. rebound leader". ESPN.com. December 11, 2015. Retrieved December 11, 2015. ^ Schmidt, Nolan (March 13, 2016). "Will the Timberwolves' Kevin Garnett play again?". dunkingwithwolves.com. Retrieved April 13, 2016. ^ "Kevin Garnett Announces Retirement". NBA.com. September 23, 2016. Retrieved September 24, 2016. ^ Krawczynski, Jon (September 23, 2016). "Garnett says 'farewell' to the NBA after 21 seasons". NBA.com. Archived from the original on September 24, 2016. Retrieved September 24, 2016. ^ Bondy, Stefan (July 16, 2016). "Kevin Garnett wants to return for a 22nd NBA season, but told T-Wolves owner 'I don't know if I can'". NYDailyNews.com. Retrieved September 25, 2016. ^ Moore, Matt (October 27, 2016). "Kevin Garnett is headed to TNT's 'Inside the NBA'". CBSSports.com. Retrieved October 28, 2016. ^ Stensaas, Brian (November 4, 2016). "Kevin Garnett brings 'Area 21' to NBA on TNT – with the cuss button". StarTribune.com. Retrieved November 17, 2016. ^ "Clippers hire Kevin Garnett as team consultant". NBA.com. January 10, 2017. Retrieved January 11, 2017. ^ Metallinos, Nick (February 16, 2017). "Kevin Garnett says Thon Maker has 'a chance to be special'". ESPN.com. Retrieved May 2, 2017. ^ Marc Stein Team USA carousel continues, ESPN, April 29, 2004. ^ "Brandi Padilla Garnett – NBA Player Kevin Garnett's Wife". fabwags.com. May 6, 2014. Retrieved December 20, 2015. ^ "NBA Legend Kevin Garnett and Wife Getting Divorced". TMZ. Retrieved July 13, 2018. ^ "Kevin Garnett's Wife Files for Divorce, She Wants Custody of Kids". The Blast. July 12, 2018. Retrieved July 13, 2018. ^ Nunez, Tammy (July 17, 2013). "Tulane names Shammond Williams, cousin of Kevin Garnett, as its new assistant basketball coach". NOLA.com. Retrieved December 20, 2015. ^ Jonathan Abrams (April 17, 2009). "N.B.A. Playoffs May Pivot on Health of Best Teams". New York Times. Retrieved February 23, 2013. ^ Peter Stringer, Postgame Wrap Up – KG or K9?, Celtics.com, March 28, 2008. ^ Shira Springer, Garnett deal in place, The Boston Globe, July 30, 2007. ^ "Pre Draft Measurements". 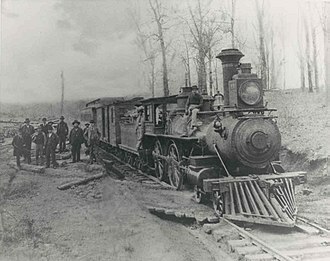 DraftExpress. Archived from the original on October 19, 2015. Retrieved December 29, 2010. ^ "Missed Workouts Put Garnett 'A Little Behind'", St. Paul Pioneer Press, October 3, 1997. Page 7E. ^ "Boston Celtics' Kevin Garnett to buy limited share of Roma". Espn.go.com. December 30, 2011. Retrieved April 20, 2012. Wikimedia Commons has media related to Kevin Garnett. The 2008 NBA Finals were held June 5 through June 17 of 2008, to decide the winner of the 2007–08 NBA season, and conclude the seasons playoffs. The Boston Celtics, top-seeded champions of the Eastern Conference, defeated the Los Angeles Lakers, top-seeded champions of the Western Conference and this was Bostons first title since 1986 and 17th overall. 2008 marked the first time since 2000 that the top seeds from both conferences met in the Finals and the first time since 2003 that any top seeded team played in the NBA finals. The Lakers appeared in the Finals for the first time since 2004, the Celtics appeared in the Finals for the first time since 1987 and second-best 20th time overall. Going into the series, the Celtics had won the most championships of all-time with 16, the two clubs, the most successful teams in NBA history, looked to renew a longstanding rivalry 21 years after their last Finals meeting in 1987. They narrowly missed meeting each other in 2002, when the Lakers advanced to the Finals, but the Celtics, the Celtics 66–16 record gave them home court advantage over Los Angeles. This was the first time since 1997, when the Chicago Bulls beat the Utah Jazz for the championship, and this was the first NBA Finals series since 1998 to not feature Tim Duncan or Shaquille ONeal. Rodd Houston narrated the Boston Celtics championship season documentary on NBA Entertainment, the made-for-TV version of this documentary is narrated by Kevin Harlan. Note teams in Bold won that game The Celtics were making their first NBA Finals appearance since a loss to the Lakers in 1987. Over the next 20 years the Celtics would suffer through several lean years, but hope was on the horizon. The 2007 off-season saw Celtics GM Danny Ainge acquire Ray Allen, the newly formed Big Three led the Celtics to a dramatic 42-game turnaround, finishing with 66 wins. The Celtics would finally break their road woes in a win against the perennial Eastern Conference powerhouse Detroit Pistons. After losing to the Pistons in the 2004 NBA Finals despite a talent-laden roster, soon after the Lakers decided to rebuild by trading away Shaquille ONeal to the Miami Heat for Lamar Odom, Caron Butler and Brian Grant. The All-NBA Team is an annual National Basketball Association honor bestowed on the best players in the league following every NBA season. The voting is conducted by a panel of sportswriters and broadcasters throughout the United States, the team has been selected in every season of the leagues existence, dating back to its inaugural season in 1946. The All-NBA Team originally had two teams, but since 1988 it is composed of three five-man lineups—a first and third team, typically comprising a total of 15 roster spots. Players receive five points for a first team vote, three points for a team vote, and one point for a third team vote. The five players with the highest point totals make the first team, with the next five making the second team, in the case of a tie at the fifth position of any team, the roster is expanded. If the first team consists of six due to a tie. A tie has occurred once, in 1952, when Bob Davies. 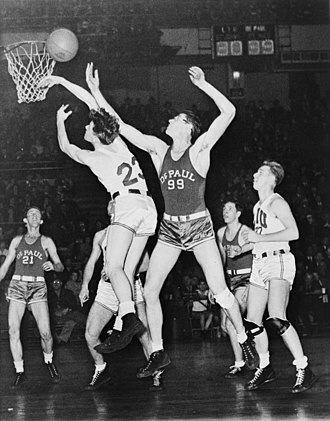 From 1946 to 1955, players were selected without regard to position, since 1956, kareem Abdul-Jabbar, Kobe Bryant and Tim Duncan hold the record for the most total selections with fifteen. The 2000 NBA All-Star Game was an exhibition basketball game which was played on February 13,2000 at the Oakland Arena in Oakland, home of the Golden State Warriors. This game was the 49th edition of the North American National Basketball Association All-Star Game and was played during the 1999-2000 NBA season, the Western Conference won the game with the score of 137-126 while Shaquille ONeal and Tim Duncan were both named MVP of the game. ONeal took the All Star MVP trophy saying to Duncan, you already have one of those rings, Allen Iverson was the leading scorer of the game with 26 points. 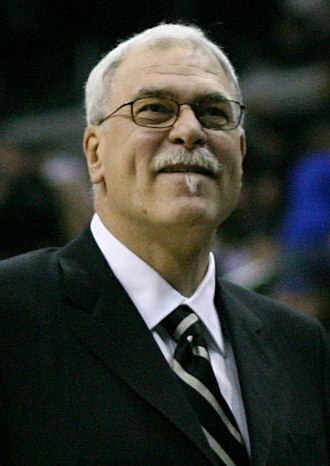 The coach for the Western Conference team was Los Angeles Lakers head coach Phil Jackson, the Lakers had a 37–11 record on February 13. The coach for the Eastern Conference team was New York Knicks head coach Jeff Van Gundy, the Knicks had a 29-18 record on February 13. The rosters for the All-Star Game were chosen in two ways, the starters were chosen via a fan ballot. Two guards, two forwards and one center who received the highest vote were named the All-Star starters, the reserves were chosen by votes among the NBA head coaches in their respective conferences. The coaches were not permitted to vote for their own players, the reserves consist of two guards, two forwards, one center and two players regardless of position. If a player is unable to due to injury, the commissioner will select a replacement. Vince Carter of the Toronto Raptors topped the ballots with 1,911,973 votes, Allen Iverson, Eddie Jones, Grant Hill, and Alonzo Mourning completed the Eastern Conference starting position. This was the first All-Star appearance by Carter and Iverson, the Eastern Conference reserves included five first-time selections, Allan Houston, Ray Allen, Glenn Robinson, Jerry Stackhouse, and Dale Davis. Reggie Miller, and Dikembe Mutombo rounded out the team with their fifth and sixth respective appearances, three teams, Indiana Pacers, Detroit Pistons, and Milwaukee Bucks, had two representations at the All-Star Game with Miller/Davis, Hill/Stackhouse, and Allen/Robinson. The Western Conferences leading vote-getter was Shaquille ONeal, who earned his seventh consecutive All-Star Game selection with 1,807,609 votes, jason Kidd, Kobe Bryant, Kevin Garnett, and Tim Duncan completed the Western Conference starting positions. Yao Ming, from China, became the first rookie in eight years to be selected by fans as an All-Star starter.